^ Fath, E. A. The spectra of some spiral nebulae and globular star clusters. Lick Observatory Bulletin. 1909, 5: 71. Bibcode:1909LicOB...5...71F. doi:10.5479/ADS/bib/1909LicOB.5.71F. ^ Curtis, H. D. Descriptions of 762 Nebulae and Clusters Photographed with the Crossley Reflector. Publications of Lick Observatory. 1918, 13: 9. Bibcode:1918PLicO..13....9C. ^ Slipher, V. The spectrum and velocity of the nebula N.G.C. 1068 (M 77). Lowell Observatory Bulletin. 1917, 3: 59. Bibcode:1917LowOB...3...59S. ^ Humason, M. L. The Emission Spectrum of the Extra-Galactic Nebula N. G. C. 1275. Publications of the Astronomical Society of the Pacific. 1932, 44: 267. Bibcode:1932PASP...44..267H. doi:10.1086/124242. ^ Mayall, N. U. The Spectrum of the Spiral Nebula NGC 4151. Publications of the Astronomical Society of the Pacific. 1934, 46: 134. Bibcode:1934PASP...46..134M. doi:10.1086/124429. ^ Mayall, N. U. The occurrence of λ3727 [O II] in the spectra of extragalactic nebulae. Lick Observatory Bulletin. 1939, 19: 33. Bibcode:1939LicOB..19...33M. doi:10.5479/ADS/bib/1939LicOB.19.33M. ^ Seyfert, C. K. Nuclear Emission in Spiral Nebulae. The Astrophysical Journal. 1943, 97: 28. Bibcode:1943ApJ....97...28S. doi:10.1086/144488. ^ Bolton, J. G.; Stanley, G. J.; Slee, O. B. Positions of Three Discrete Sources of Galactic Radio-Frequency Radiation. Nature. 1949, 164 (4159): 101. Bibcode:1949Natur.164..101B. doi:10.1038/164101b0. ^ Baade, W.; Minkowski, R. Identification of the Radio Sources in Cassiopeia, Cygnus A, and Puppis A.. The Astrophysical Journal. 1954, 119: 206. Bibcode:1954ApJ...119..206B. doi:10.1086/145812. ^ Schmidt, M. 3C 273 : A Star-Like Object with Large Red-Shift. Nature. 1963, 197 (4872): 1040. Bibcode:1963Natur.197.1040S. doi:10.1038/1971040a0. ^ Greenstein, J. L.; Matthews, T. A. Red-Shift of the Unusual Radio Source: 3C 48. Nature. 1963, 197 (4872): 1041 [22 March 2017]. Bibcode:1963Natur.197.1041G. doi:10.1038/1971041a0. ^ Shields, G. A. A Brief History of Active Galactic Nuclei. Publications of the Astronomical Society of the Pacific. 1999, 111 (760): 661 [22 March 2017]. Bibcode:1999PASP..111..661S. arXiv:astro-ph/9903401. doi:10.1086/316378. ^ Lynden-Bell, Donald. Galactic Nuclei as Collapsed Old Quasars. Nature. 1969, 223: 690 [22 March 2017]. Bibcode:1969Natur.223..690L. doi:10.1038/223690a0. ^ Lasers and supermassive black holes. www.spacetelescope.org. [1 January 2018]. ^ Lynden-Bell, D. Galactic Nuclei as Collapsed Old Quasars. Nature. 1969, 223 (5207): 690–694. Bibcode:1969Natur.223..690L. doi:10.1038/223690a0. ^ Kazanas, Demosthenes. Toward a Unified AGN Structure. Astronomical Review. 2012, 7 (3): 92–123. Bibcode:2012AstRv...7c..92K. arXiv:1206.5022. doi:10.1080/21672857.2012.11519707. ^ Marconi, A.; L. K. Hunt. The Relation between Black Hole Mass, Bulge Mass, and Near-Infrared Luminosity. The Astrophysical Journal. 2003, 589 (1): L21–L24. Bibcode:2003ApJ...589L..21M. arXiv:astro-ph/0304274. doi:10.1086/375804. ^ Narayan, R.; I. Yi. Advection-Dominated Accretion: A Self-Similar Solution. Astrophys. J. 1994, 428: L13. Bibcode:1994ApJ...428L..13N. arXiv:astro-ph/9403052. doi:10.1086/187381. ^ Fabian, A. C.; M. J. Rees. 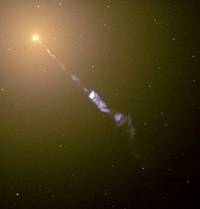 The accretion luminosity of a massive black hole in an elliptical galaxy. Monthly Notices of the Royal Astronomical Society. 1995, 277 (2): L55–L58. Bibcode:1995MNRAS.277L..55F. arXiv:astro-ph/9509096. doi:10.1093/mnras/277.1.55L. ^ Vermeulen, R. C.; Ogle, P. M.; Tran, H. D.; Browne, I. W. A.; Cohen, M. H.; Readhead, A. C. S.; Taylor, G. B.; Goodrich, R. W. When Is BL Lac Not a BL Lac?. The Astrophysical Journal Letters. 1995, 452 (1): 5–8. Bibcode:1995ApJ...452L...5V. doi:10.1086/309716. ^ HINE, RG; MS LONGAIR. Optical spectra of 3 CR radio galaxies. Monthly Notices of the Royal Astronomical Society. 1979, 188: 111–130. Bibcode:1979MNRAS.188..111H. doi:10.1093/mnras/188.1.111. ^ Laing, R. A.; C. R. Jenkins; J. V. Wall; S. W. Unger. Spectrophotometry of a Complete Sample of 3CR Radio Sources: Implications for Unified Models. The First Stromlo Symposium: the Physics of Active Galaxies. ASP Conference Series. 1994, 54. ^ Baum, S. A.; Zirbel, E. L.; O'Dea, Christopher P. Toward Understanding the Fanaroff-Riley Dichotomy in Radio Source Morphology and Power. The Astrophysical Journal. 1995, 451: 88. Bibcode:1995ApJ...451...88B. doi:10.1086/176202. ^ 24.0 24.1 Chiaberge, M.; A. Capetti; A. Celotti. Understanding the nature of FRII optical nuclei: a new diagnostic plane for radio galaxies. Journal reference: Astron. Astrophys. 2002, 394 (3): 791–800. Bibcode:2002A&A...394..791C. arXiv:astro-ph/0207654. doi:10.1051/0004-6361:20021204. ^ 25.0 25.1 Hardcastle, M. J.; D. A. Evans; J. H. Croston. The X-ray nuclei of intermediate-redshift radio sources. Monthly Notices of the Royal Astronomical Society. 2006, 370 (4): 1893–1904. Bibcode:2006MNRAS.370.1893H. arXiv:astro-ph/0603090. doi:10.1111/j.1365-2966.2006.10615.x. ^ Grandi, S. A.; D. E. Osterbrock. Optical spectra of radio galaxies. Astrophysical Journal. 1978, 220 (Part 1): 783. Bibcode:1978ApJ...220..783G. doi:10.1086/155966. ^ Antonucci, R. Unified Models for Active Galactic Nuclei and Quasars. Annual Review of Astronomy and Astrophysics. 1993, 31 (1): 473–521. Bibcode:1993ARA&A..31..473A. doi:10.1146/annurev.aa.31.090193.002353. ^ Urry, P.; Paolo Padovani. Unified schemes for radioloud AGN. Publications of the Astronomical Society of the Pacific. 1995, 107: 803–845. Bibcode:1995PASP..107..803U. arXiv:astro-ph/9506063. doi:10.1086/133630. ^ Laing, R. A. The sidedness of jets and depolarization in powerful extragalactic radio sources. Nature. 1988, 331 (6152): 149–151. Bibcode:1988Natur.331..149L. doi:10.1038/331149a0. ^ Garrington, S. T.; J. P. Leahy; R. G. Conway; RA LAING. A systematic asymmetry in the polarization properties of double radio sources with one jet. Nature. 1988, 331 (6152): 147–149. Bibcode:1988Natur.331..147G. doi:10.1038/331147a0. ^ Barthel, P. D. Is every quasar beamed?. Astrophysical Journal. 1989, 336: 606–611. Bibcode:1989ApJ...336..606B. doi:10.1086/167038. ^ Belsole, E.; D. M. Worrall; M. J. Hardcastle. High-redshift Faranoff-Riley type II radio galaxies: X-ray properties of the cores. Monthly Notices of the Royal Astronomical Society. 2006, 366 (1): 339–352. Bibcode:2006MNRAS.366..339B. arXiv:astro-ph/0511606. doi:10.1111/j.1365-2966.2005.09882.x. ^ Ogle, P.; D. Whysong; R. Antonucci. Spitzer Reveals Hidden Quasar Nuclei in Some Powerful FR II Radio Galaxies. The Astrophysical Journal. 2006, 647 (1): 161–171. Bibcode:2006ApJ...647..161O. arXiv:astro-ph/0601485. doi:10.1086/505337. ^ Browne, I. W. A. Is it possible to turn an elliptical radio galaxy into a BL Lac object?. Monthly Notices of the Royal Astronomical Society. 1983, 204: 23–27P. Bibcode:1983MNRAS.204P..23B. doi:10.1093/mnras/204.1.23p. ^ Tran, H.D. Hidden Broad-Line Seyfert 2 Galaxies in the CFA and 12 $\mu$M Samples. The Astrophysical Journal. 2001, 554: L19–L23. Bibcode:2001ApJ...554L..19T. arXiv:astro-ph/0105462. doi:10.1086/320926. ^ Wu, Y-Z; 等. The Different Nature in Seyfert 2 Galaxies With and Without Hidden Broad-line Regions. The Astrophysical Journal. 2001, 730 (2): 121–130. Bibcode:2011ApJ...730..121W. arXiv:1101.4132. doi:10.1088/0004-637X/730/2/121. ^ Elitzur, M.; Shlosman I. The AGN-obscuring Torus: The End of the Doughnut Paradigm?. The Astrophysical Journal. 2006, 648 (2): L101–L104. Bibcode:2006ApJ...648L.101E. arXiv:astro-ph/0605686v2. doi:10.1086/508158. ^ Nicastro, F. Broad Emission Line Regions in Active Galactic Nuclei: The Link with the Accretion Power. The Astrophysical Journal. 2000, 530 (2): L101–L104. Bibcode:2000ApJ...530L..65N. arXiv:astro-ph/9912524. doi:10.1086/312491. ^ Ricci, C.; Walter R.; Courvoisier T.J-L; Paltani S. Reflection in Seyfert galaxies and the unified model of AGN. Astronomy and Astrophysics. 2010, 532: A102–21. Bibcode:2011A&A...532A.102R. arXiv:1101.4132. doi:10.1051/0004-6361/201016409. ^ Wang, J.M. ; Du P.; Baldwin J.A. ; Ge J-Q. ; Ferland G.J. ; Ferland, Gary J. Star formation in self-gravitating disks in active galactic nuclei. II. Episodic formation of broad-line regions. The Astrophysical Journal. 2012, 746 (2): 137–165. Bibcode:2012ApJ...746..137W. arXiv:1202.0062v1. doi:10.1088/0004-637X/746/2/137. ^ Laor, A. On the Nature of Low-Luminosity Narrow-Line Active Galactic Nuclei. The Astrophysical Journal. 2003, 590: 86–94. Bibcode:2003ApJ...590...86L. arXiv:astro-ph/0302541. doi:10.1086/375008. ^ Elitzur, M.; Ho L.C. ; Trump J.R. Evolution of broad-line emission from active galactic nuclei. Monthly Notices of the Royal Astronomical Society. 2014, 438 (4): 3340–3351. Bibcode:2014MNRAS.438.3340E. arXiv:1312.4922. doi:10.1093/mnras/stt2445. ^ Elitzur, M. On the Unification of Active Galactic Nuclei. Astrophysical Journal Letters. 2012, 747 (2): L33–L35. Bibcode:2012ApJ...747L..33E. arXiv:1202.1776. doi:10.1088/2041-8205/747/2/L33. ^ Antonucci, R. A panchromatic review of thermal and nonthermal active galactic nuclei. arXiv:1210.2716. ^ Laurikainen, E.; Salo H. Environments of Seyfert galaxies. II. Statistical analyses. Astronomy and Astrophysics. 1995, 293: 683. Bibcode:1995A&A...293..683L. ^ Dultzin-Hacyan, D.; Krongold Y.; Fuentes-Guridi I.; Marziani P. The Close Environment of Seyfert Galaxies and Its Implication for Unification Models. Astrophysical Journal Letters. 1999, 513 (2): L111–L114. Bibcode:1999ApJ...513L.111D. arXiv:astro-ph/9901227v1. doi:10.1086/311925. ^ Koulouridis, E.; Plionis M.; Chavushyan V.; Dultzin-Hacyan D.; Krongold Y.; Goudis C. Local and Large-Scale Environment of Seyfert Galaxies. Astrophysical Journal. 2006, 639: 37–45. Bibcode:2006ApJ...639...37K. arXiv:astro-ph/0509843. doi:10.1086/498421. ^ Villarroel, B.; Korn A.J. The different neighbours around Type-1 and Type-2 active galactic nuclei. Nature Physics. 2014, 10 (6): 417–420. Bibcode:2014NatPh..10..417V. arXiv:1211.0528v1. doi:10.1038/nphys2951. ^ Donoso, E.; Yan L.; Stern D.; Assef R.J. The Angular Clustering of WISE-Selected AGN: Different Haloes for Obscured and Unobscured AGN. The Astrophysical Journal. 2014, 789: 44. Bibcode:2014ApJ...789...44D. arXiv:1309.2277. doi:10.1088/0004-637X/789/1/44. ^ Krongold, Y.; Dultzin-Hacyan D.; Marziani D. The Circumgalactic Environment of Bright IRAS Galaxies. Astrophysical Journal. 2002, 572: 169–177. Bibcode:2002ApJ...572..169K. arXiv:astro-ph/0202412. doi:10.1086/340299. ^ Villarroel, B.; Nyholm A.; Karlsson T.; Comeron S.; Korn A.; Sollerman J.; Zackrisson E. AGN luminosity and stellar age - two missing ingredients for AGN unification as seen with iPTF supernovae. The Astrophysical Journal. 2017, 837 (2): 110. Bibcode:2017ApJ...837..110V. arXiv:1701.08647v1. doi:10.3847/1538-4357/aa5d5a.